One thing about summer – you get a lot of the same foods in your box, over and over again. A glass-half-empty type might yawn “Boring!” and roll her eyes at the six-millionth bag of basil, shoving it in the back of the fridge next to the other limp and blackened bunches. But a perky glass-practically-brimming-full type will see this as an opportunity to really stock up, to get ahead on the endless task of feeding her family. For the first, exhausted half of the summer I would use a few leaves from each bunch of basil, pairing them with some tomatoes or garnishing a dish, and then, sad to say, the blackening and wilting would begin in earnest. But the basil, undeterred, kept arriving each week, each bunch fuller and more bountiful than the last. It was time to do right by this basil, I finally decided. The thing is, I don’t like pesto that much. It’s often too oily and sticky and rich, and sometimes I even get a gross little rash around my mouth when I eat it. But that’s what you do with massive quantities of basil, you make pesto. I do like to always have pesto on hand that I’ve frozen into ice cube trays so I can throw a cube or two into soups and other things that need a little boost, so I figured I would just fill a lot of ice cube trays. My family has a beloved heirloom pesto recipe that has been passed down to me, but I ventured out to find recipes for vegan pesto so that the basil bounty would be edible for all members of the household. I came across several versions, including some that were just the usual pesto recipe without the parmesan cheese, but Duck and I had already tried this as a basil puree and had found it too strong and sharp without the cheese to mellow things out. The one that sounded best to me was this vegan pesto recipe from the vegan blog Vegan Spoonful that uses nutritional yeast in the place of the cheese. I was dubious at first, because everyone is always trying to claim that nutritional yeast is “just like cheese!” “Put it on your popcorn – just like cheese!” “Make vegan mac and cheeze!” But no, no, it’s not like cheese, and don’t insult me by pretending that it is. Duck was the designated pesto processor, so I had him make a small batch to start so we could taste it and see what we thought. Ladies and gentlemen – when it comes to pesto, nutritional yeast is not just like cheese, nope, it is BETTER. All the creamy, mellowing effects, with none of the greasy heaviness. This was some of the best pesto I’ve ever tasted. Duck blended it all, using bunch after bunch of basil that had been stockpiling in the fridge. We ended up with a huge jar of pesto which I resolved to get into freezer trays as soon as possible. But my freezer plans went out the window when Duck cooked dinner that night. 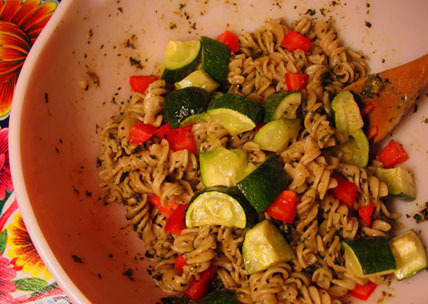 He prepared a batch of Tinkyada gluten-free pasta spirals, roasted chunks of zucchini in the toaster oven, cut up sweet, fresh summer tomatoes, and stirred all of it up with our shiny new pesto. It has been years since I’ve enjoyed pasta. I don’t like simple carbs very much, wheat makes me sick, and I OD’d on it in college before I was a junior. But this Tinkyada brown rice pasta is incredible. It has a toothiness that is one of the best textures I’ve ever put in my mouth. And considering that gluten-free pasta is generally known for its horrid texture, this is nothing short of a miracle. And, combined with the yummy roasted zucchini (another vegetable that shows up week after week without mercy), the juicy tomato, and our heavenly pesto, this pasta dish is quickly becoming a dinnertime favorite. The other day I finally decided I’d better put the pesto in the freezer in case it started to go bad. I fetched the jar and looked inside – there’s about enough left from our huge jar’s worth to maybe make another bowl of pasta. Clearly I’ve been converted! A note: We made this again last night, using these proportions, and it was terrible! Very sharp and “plant-like” from the basil. We added more pine nuts, nutritional yeast, and olive oil, in small batches, until it tasted perfect again. So you may need to play a little to get it just right. Place all ingredients except the olive oil and nutritional yeast into a food processor. Process to a finely ground consistency. Add olive oil and process again, until smooth and creamy. Add nutritional yeast and process again until creamy. Serve immediately or store in the refrigerator. This entry was posted in CSA, Gluten-free product reviews, Recipes, What I did with my box and tagged basil, community supported agriculture, gluten-free, vegan.